Our displays are made in Melbourne Australia, with a growing collection of original styles and sensational colours to choose from. 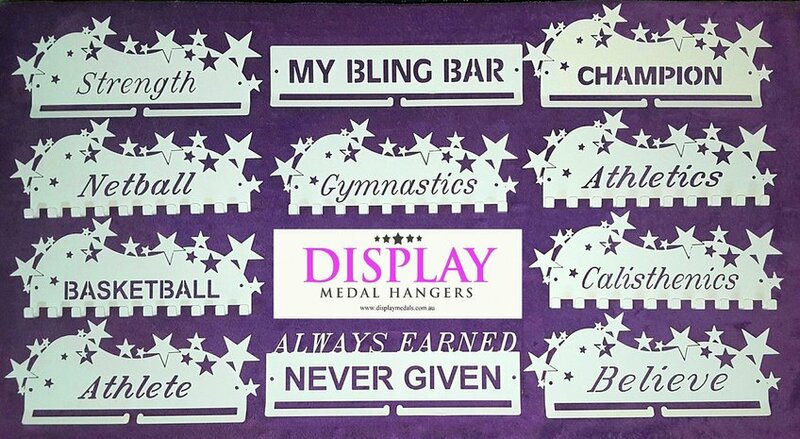 Our current range is made up of our own designs, including Athlete, Athletics, Always Earned Never Given, Champion, Believe, Dance, Cheer, Calisthenics, Gymnastics, Strength, My Bling Bar, Netball, Basketball, and more on the way! White, Black Red, Blue, Green, Pink or Purple. All products are 100% AUSTRALIAN MADE, made from high quality steel, and are professional finished by powder-coating the final colour. You can place a group order through your club/academy/association, or you can order individually through our store anytime. We accept cash, visa, mastercard or bank transfer. We do not accept Paypal or Amex at this time.